You can search for hotels using your device’s current location, a city name, airport, landmark or address. Searching by address will ensure that only hotels close to that location are shown. Your company's preferred hotels will be available and prioritized in the search results. 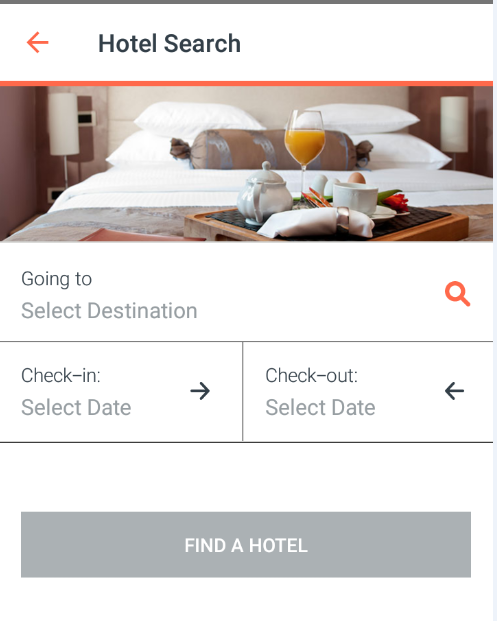 Hotel booking is a client setup item. In some cases, you may be in a country which doesn’t yet offer the mobile hotel booking option. Please speak with your Travel Manager to enable hotel booking. If your company has a hotel allowance as part of its policy, you will be able to see which hotels exceed your company’s spend policy in the results page. myCWT displays rates that are inclusive of taxes and fees that will be incurred. Viewing your hotel bookings made on myCWT in your trip library on your OBT may vary on your company’s setup. If you are able to view Travel Counselor reservations on your OBT, you will also be able to see your mobile hotel bookings on your OBT. You are only able to cancel the hotel bookings that were made via myCWT. All other hotel bookings must be cancelled with a counselor or online booking tool.